Magic Mushrooms in Religion and Alchemy is an illustrated journey into the hidden truth about the use of psychoactive mushrooms to connect with the divine. 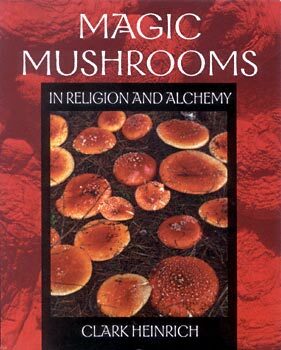 Clark Heinrich provides a strong case that Amanita muscaria, the fly agaric mushroom, played a significant role in world religions. He shows that this "magic mushroom" was the mysterious food and drink of the gods, confirming the role of the fly agaric mushroom in generating religious visions. He traces its use in Vedic and Puranic religion, illustrating how ancient cultures used the powerful psychedelic in esoteric rituals meant to bring them into direct contact with the divine. Heinrich then shows how the same mushroom symbols found in Hindu scriptures correspond perfectly to the symbols of ancient Judaism, Christianity, the Grail myths, and alchemy. He contends that the famed philosophers' stone of the alchemist was a metaphor for the fly agairc mushroom, and that stories as disparate as the burning bush of Moses and the raising of Lazarus from the dead can be easily explained by the use of this strange and powerful mushroom. Heinrich concludes that in many religious cultures and traditions the fly agaric mushroom -- and in some cases ergot or psilocybin mushrooms -- had a fundamental influence in teaching humans about the nature of God. ". . . fascinating, scholarly, and original . . . I love it." ""An extraordinary and beautiful book. . . . I read it with the highest interest and enjoyed enormously following its excursions into the realm of myths and the origins of religions, into fascinating possible connections. I have learned a good deal."